A project that was to start in late 00, an intervening little old lady in an old Datsun put a somewhat permanent damper on things. When I finally got back into things nine or so months later I had kind of forgotten about it, and thats as far as it went. Plus, for some reason, we never sold that many Raptors. Which surprised me given how well they went and how they rode. So, as a reminder for what I was hoping to do, we have an un-sellable TL1000S PCII hanging around at work that was going to go onto a Raptor for some playing. I didnt even get to dyno a Raptor until early this year (04), so took the chance to try a couple of things, plus learn a little more about them. I had come up with a throttle position sensor (TPS) resetting procedure some time ago, similar in concept to what we do with Ducati/Guzzi/MV Weber systems and BMW. Just a baseline procedure that relates the TPS to the throttle blade in a repeatable way. This was aimed at ending up where we were told they should be set for idle, but using a throttle blade completely shut voltage reference to get there. Fairly simple and quite successful, particularly for low speed performance on bikes fitted with aftermarket pipes. 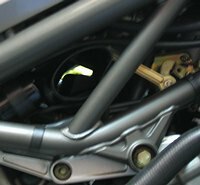 The injection system Suzuki used for the TL1000S, borrowed by Cagiva for the Raptor, is, as could be expected from a Japanese manufacturer, amazingly complicated. Using air box (manifold?) vacuum at low load (read low throttle openings) and RPM/throttle position at higher load (the normal Weber/Bosch method), the massive array of vacuum lines attached to the throttle body and various switches, relays and actuators on the throttle body assembly and airbox is quite amazing. Youd wonder how the various Italian Weber and BMW Bosch equipped bikes work without any of it. Plus they have added features like a gear position switch to tell the ECU what gear the bike is in, so it can factor enrichment into the fuel pulse for higher gears. I had been told that they run richer in 5th and 6th than the lower gears, a carry over from the TL no doubt that had air runners ducted through from the side fairings supplying air to the airbox. A somewhat slap happy solution to the age old problem of not putting an air pressure sensor inside the airbox where it belongs instead of inside the ECU where its cheaper. So that was something else I wanted to test for. Of course, if it worked well itd be fine, but the TL1000S was plagued by the low speed running issues that so many manufacturers seem to struggle with. Ive come to learn that usually on a Weber system its just a set up issue, so I went looking for a good set up procedure on the Raptor. We had been giving an idle TPS voltage setting to use, but just like the BMW setting, an idle voltage setting is not that useful when you dont know what the throttle angle is. So the procedure I developed works from throttle blade completely shut, then opened to the given idle voltage setting. This isnt to say my method is the be all and end all, but its based on simple, repeatable procedure and measurement  something you get drummed into you in engineering classes  and it seems to work well. So far at least. Once I had this worked out, I wanted to get hold of a bike to see how much power it made and what effect fitting some pipes had. Previous graphs Id seen in magazines for the Raptor surprised me, as they were only getting around 100Hp from them. Whereas a TL1000S was good for 115 or so std. I had an idea of why, but the testing I did proved that to be crap. So, a graph. Green is an all std Raptor that has had our TPS reset carried out (not that I would expect that to make any difference to WOT performance) running in 4th gear. Blue is 5th gear. Red is 6th gear. Due to a rather obvious error made by the operator (me) however, the air/fuel traces arent that good. But, they do show what happened. That is, the higher the gear, the richer the trace. Especially in the upper half of the RPM range. Not much richer, but it was consistant on all runs. Actually, to make that a bit clearer, Ill show the some graph plotted against time. The air/fuel trace is just lagging quite a bit, thats all. Given this result, I chose 5th gear as the gear for testing. Just for consistancys sake and because it gave the median result. Next I removed the air box inlet rubber snorkel thingys. These fit to each end of the airbox inlet, and hide the air inlet just up inside the frame, under the lower edge of the tank. 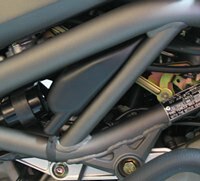 With them removed, the air inlets are open to each side of the bike, just in front of the rear cylinder. The photos below show the rubbers (left) and what it looks like with them removed (right). And yes, you can see right thru the airbox and out the other side on the RH photo. Thats a yellow R1150R you can see a rather blurry glimpse of. This I expected to make quite a difference, and was my theory as to why the TL made so much more power. Turned out, as previously mentioned, to be crap. Its truly amazing how much power some engines make thought tiny air openings. Next graph shows the all std 5th gear run (blue in the first graph) in green and air box inlet rubber snorkel thingys removed in red. Not much difference at all. Some more noise yes, but thats about it. Although if Id got the air/fuel thing right you would see that it did go a little leaner, but only from 11.7:1 to about 12:1. Not much in it, really. So this graph has power only. Next we added the Staintunes. These are unusually loud on a Raptor compared to pretty much identical mufflers as used on the Ducati models, with a real harsh blat noise that TL also make when fitted with slip ons. A TL1000S with Yoshi mufflers is really offensive in a way a Ducati never is, due simply to the harshness of the note. My theory on this is that the header pipes, which I also believe are borrowed from the TL100S, have no flowing cross over, just a balance pipe of sorts that joins both headers at right angles. So each cylinder exhausts through one muffler, whereas all the Ducati run each cylinder through both mufflers. Again, I could be wrong. I also didnt bother re-fitting the airbox inlet rubbers as I didnt see the point, and theyre quite annoying to fit. Green is with std mufflers, red is with Staintunes. Some improvement in the curve, but not a huge amount. As expected for modern, well designed original mufflers pretty much. The other benefits that dont show up on a WOT dyno run, such as response and smoothness, are there as usual too. In this form they go very nicely, albeit rather loudly. As for the fuel curve, Ill show another graph plotted against time, so you get to see what happened. The mufflers lean the mixture all through the range, although its not that much and it wouldnt concern me in the slightest really. It doesnt go lean enough anywhere that I would expect it to be costing power. Now this power curve looks pretty good, until you add a torque curve to it and you get a feel for whats actually happening. The shape of the torque curve and what happens to it after the torque peak up to the power peak tell you quite a bit about the engine. Remember how I said the Raptor engine was rather lacking in power compared to the TL motor? Well, the graph below show the power and torque curves with Staintunes fitted. The torque peaks at 7,000 RPM and then falls, and you can see the power curve begin to flatten there. At 7,000 RPM, the TL1000S curve keeps going, not flattening off for another 2,000 or so RPM. Which is how it makes about 15 more Hp compared to this engine. Why, I have no idea. I thought it may have been inlet based (the rubber thingys) or maybe header based, but I believe the headers are TL anyway. We were told the engines were identical to the TL100S motor, but Ive got my doubts. Suzuki wouldnt let Cagiva sell the Raptor in some markets  USA mainly  for fear of it damaging sales of their own bikes. Now theyve released the SV1000 you can see why. Maybe they limited them some other way. Dunno, but the Raptor certainly doesnt make the top end power a 996cc 4 valve twin should. Not that you notice it on the road though. The fall of the torque curve isnt really noticeable as far as I can tell, as the engines rev very happily, cleanly and (most importantly) quickly to 10,000 RPM. And they certainly still go like youd hope. 107 hp is still more than ample for a light bike like this, but we all know ample is never enough. So thats my take on the Raptor. It may not make all the power Id expected, but at least we know how to make then run nicely now.